I have been fishing the upper American River for my whole life. Over the years I have hooked into more than a few American River residents that got the best of me in the fight leaving me in much suspense. I damn near dedicated my life on landing the ones that got away. Biking down the trails you could see the Striper off the clay banks of Sailor Bar if you catch the sunrise at the right time. I can still remember the day when I rode up to my spot and then snuck out to the edge and peeked over. 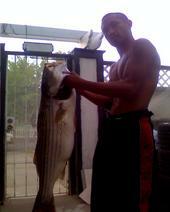 O.M.G., what I saw was a striper bigger then I ever seen out there. He disappeared into the deep water but I was fixed on landing that fish. The area to fish was horrible and he was so big that if he decided to run it would be impossible for me to land him. Still, that didn't stop me. I literally came prepared with a life preserver if he took me down. I was willing to jump in and go down with him. I studied their everyday routine and put everything you can possibly think in their face - from sardines to broken-back-rebels, pencil poppers - you name it. Still, they would just follow it up and then swim off. I knew I was soon going to fulfill my dream soon, I could just feel it. My buddies didn't believe me since I would always have these crazy stories of the hogs I would see, but nothing to show, just another fish story. That was all about to change soon today. A few days ago I had lost two big dogs back 2 back in the tree lines when they took me off into a bunch of line tangles and snags. I was pissed. set my mind on clearing out all the hang ups so that I would be able to land a fish in that same spot. I literally was out there for 2 to 3 hours clearing up the nest of lines from fishermen snags to piles of ropes and junk from river rafters. Later that night I came back at sundown and was excited about my odds now. I cast out my rubber worm once and boom, got a hit, I missed the bite, and reeled in quickly. Casted it back out and got slammed. Boom! It was on but this fight was unlike any other hog I set into. This time after setting the hook and pulling in, instead of the fish coming in, he literally pulled down, spooling me, taking like forever to where I had to stop the spool manually by hand with my finger tapping it off and on. This went on for about 25 to 35 minutes hearing my 10 lb test line on the edge of snapping now. I was pulling line off my spool so my line wouldn't twist and snap. I could see the line stretching. I had the fish at least a hundred yards out in front of me and he keeps going down. I start running down river. I whipped him. He was out so far I could see him belly up, but he was so big I couldn't keep pulling back on my rod without snapping my line. I literally had to pull back and then reel, inching him to the shore inch by inch. When I got him in, I was thinking that this tops my last beast. Although my record fish was 45 lbs 49 inches caught three years ago on 15 lbs test, this fight was much more challenging. That is one hellava striped bass! You mustav ate for a week off of that big bad bruiser. Did you mount it? That is so super sticky sick man! 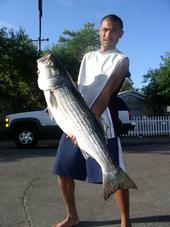 I can only dream of smashin on some stripers like dat dude. WOW!! To land a monster like that on 10 lbs. test line in the river is not easy. You got to have skillz to do that. Anyways great story and nice pictures. 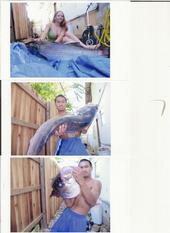 I believe I seen another article and pic of you in the Fish Sniffer newspaper awhile back. That's a beast. Gotta be a pro to land that on 10lb. You should start a guide service. Join in and write your own page! It's easy to do. How? Simply click here to return to Striped Bass Pictures. 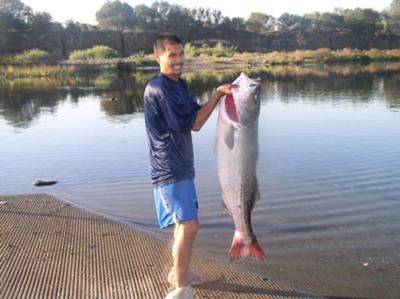 American River resident caught on black rubber yamamoto with a bullet weight and 15 lb test line. Jason's response: So sick! That is an awesome striped bass. Great catch! That's the quality type of fish that can be found running back and forth through the good ol' California Delta, up through the river systems and sloughs, such as the San Joaquin River and the American River, which is where you landed that big, bad and beautiful mama. For those of you that don't know, the California Delta waterways are one of the top fisheries in the world. 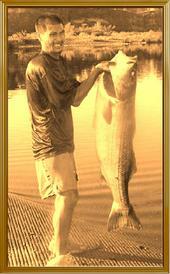 And as you can see, these striped bass fishing pictures help prove it. Can anyone tell me where I can find big stripers and how to get there? I live in Elk Grove. Right now I fish out at the Barge Canal Recreational Access in West Sac. I'm looking for new and productive sites to fish. I appreciate any info given. Just a few striped bass photos of the hogs that I slayed. I am officially the American River Striper King! Anyone disagree??? Put up your striped bass fishing photos and show me what cha got. I have plenty more where that came from. Jason's response: Sounds like a challenge to me. :-) Very nice stripers. Thanks for sharing the cool fishing pictures. Ever Heard of Catch and Release??? I live on this river and have caught many nice striped bass to 30 pounds. To ensure that this fishery stays with us you have to let the big hens go. Sure hope you start thinking about catch and release so my kids may have a chance to catch fish like the ones you are holding. More proof for you non-believers to drool on! These aren't all I have. I also have photos of the hogs that I put my friends on too, ranging from 20 to 34 pounds. My ex girlfriend landed a 30 pounder in just 4 feet of water. Read my story in the 2010 fishing photo contest titled Created My Own Destiny. Hey Striper King, stop killing big fish. I've got many over 30lbs and three over 40 and have let them all go. Its just not right to kill something that special. Please, if you're hungry I'll buy you dinner. My opinion is to Certify the monsters for top 50 lists or water body records. I am attempting to certify and release. But if a striper dies, then fine, more being him to eat the bait and grow. I let go all non trophy stripers and a few over 30. Fish HARD!!!!!!!!!! Texas!!!!!!!!!!!! To D. Holland - Sir, God has given us a blessing. There are plenty of fish for all. You seem to take the joy out of life. Those are some really big hens! I've talked to old timers over the years about how they normally used to catch 30-40 pounders like that too. The amount of crap in the water these days can be a burden to these big fish, and these days it should not be taken with ease. Be careful if anybody plans to eat any fresh fish that they catch. Education is the key, which seems to be lacking in a lot of people. Fishing is a lot of fun, especially while out making memories with the younger kids of every generation. 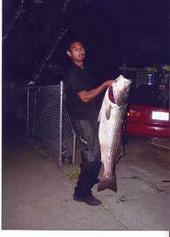 45 pounds, 49 inch striped bass caught on 15 pound test line, a bullet weight, and a black artificial worm. For all you who don't know about the American River monsters that run the river all year around, if you want to catch these fish, you're going to need to do your homework. They're not dumb fish. They didn't get this big out here by being stupid and overly aggressive. With that being said, nobody produces hogs like I do. I know this river inside and out. Meaning, under the water and outside the water. Learning the deep water holes and feeding zones, not to mention available fishing places where you will be able to land these beasts. If I wasn't on my mountain bike riding down the bike trail looking for fishing holes, I was in my kayak studying it on my kayak. Doing one thing at a time - it's too hard to multi-task and get a good observation of what your looking for. Study time is study time, and fishing is fishing time. Understand? Spots off the river where you can find bait fish. Weed beds are also good cover for fish, so stripers like to sneak around hoping to catch some prey by surprise. Also spots where it goes from rapids to deep water. Stripers love holding in these spots cuz the current makes it hard for anything to stick around and mess with them. I'm going to tell you what to do to catch these hogs without losing time and getting discouraged. But first, I'm going to tell you how I got so obsessed with these fish. Growing up in the Carmichael area, the American River was a common fishing and hang out for me and my friends. Many nights we would be out on the river to see a lot of action going on in the river. Everything from baby trout swimming frantically on top of the river getting chased by what look like submarines. Schools of shad fry boiling in the thousands getting smashed by schoolies. This is what made me so determined to catch these fish. Although they were there, I spent years not producing that big one. I thought I tried it all - from bait fishing to artificial baits, plastics,... you name it. 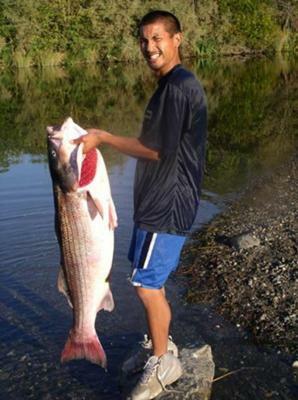 I don't know about you other anglers, but bait fishing in the American River for Stripers is just not my style. These striped bass fishing tips will help you tremendously. First, let me tell you that all my fish were caught from the bank on artificial baits, from plastics to lures. In order to fish your lures sufficiently, you need to run light line. That will help you to get your lures further out there and fish it the way you want it too. Pay attention to all of your settings - from your fishing rod (light action 8-12lb), making sure it matches what fishing line you're using, the amount of your spool capacity, and so fourth. These are key to being successful when fishing on the American River. There's no better one, meaning a heavy action rod that you can put 20 lbs test on, or light action down to 10 lbs. Keep in mind that I'm a realist, so I say if you're fishing for the hogs, then you want to have a fishing rod that's longer than 6 feet for sure. I prefer a 8'6". Anyone who knows about big dogs knows what I'm saying. Fish your top water baits with a heavy action rod and 15-20 pound test. Casting into the boil and deep water drop offs. When fishing light tackle, use smaller lures and plastics. Cast these in the lower level rapids ranging from 3 feet of water to 5 feet. These are known feeding zones for stripers. Last, but not least, focus on calm river coves. These are known for feeding zones where stripers chase their food into. These spots are ideal for light tackle cause you have plenty of room to fight your fish. When that fish grabs and runs, remain calm, trust your line and drag, let the fish wear himself out, and never try to horse him in. If he's not belly up, then he has no business outside of the water. This will save you from losing your fish. And don't forget, keep that tip in the air as much as possible. Good luck. There are a lot of details and tips I can mention, but I will leave that to you to figure out. If you follow what I said above, you will have great success. Jason's response: Awesome stuff! Thanks a million for sharing your striped bass pictures, your story, and the helpful tips for catching and landing those trophy sized stripers. Nicely done! For those of you interested in more information about striper fishing, you can check out these additional striped bass fishing tips and techniques. That's a trophy!!! Good, common sense tips. Very nice post. I admire your passion for fishing the AR. Your writing is pretty cool too. 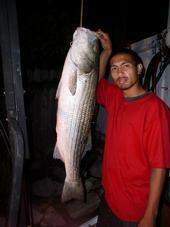 Some striper junkies like myself sometimes don't want to post what they've caught on the internet. I don't mean to brag, but I've landed hundreds of American River bass over 30 pounds. And I got a 54 pound fish last year. New in Sacramento. When do striped bass run here?